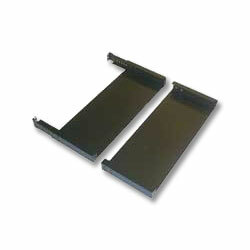 The AnyServer Bracket is a simple, yet sturdy solution to secure virtually any server to a 19"-wide, two-post open rack. It is the ideal, cost-effective system for retrofitting existing racks to accommodate one or more servers instead of reverting to a four-post rack or cabinet system. The anyServer Bracket can be adjusted to fit all of your server's requirements enabling you to keep the same mounting system even if you change equipment in the future.